Consumer watchdogs Progressive Change Campaign Committee, one of the groups behind last month’s Net Neutrality protests in Mountain View (which produced the amazing and as of yet unverified statistic that 600 Google employees signed an anti-Google/Verizon petition) have now one-upped themselves by buying ads through Google’s own content network and on competitor Facebook in conjunction with OneWebDay. The ads, which are not subtle or artful, redirect to an open letter to Google founders Sergey Brin and Larry Page. As Google’s founders, you coined the company motto: “Don’t be evil.” As a Google user, I am telling you, live up to your motto and don’t be evil. The deal between Google and Verizon is evil. 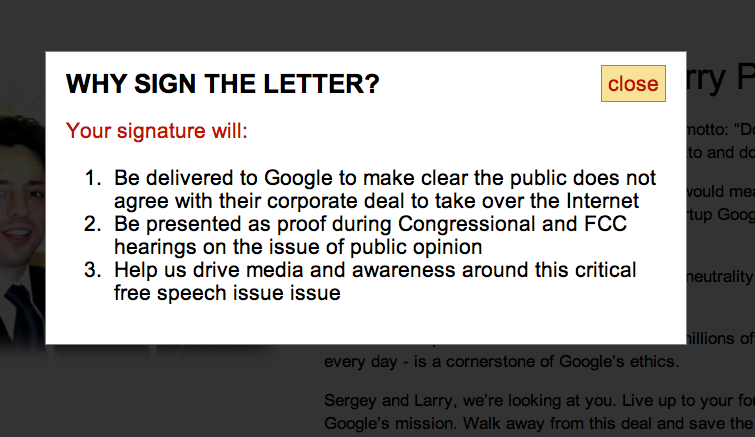 It would mean corporate control over the Internet, and it would prevent future startup Googles from ever existing. The deal between Google and Verizon to kill net neutrality would make the Internet less accessible and useful. The free and open Internet – which hundreds of millions of people rely on every day – is a cornerstone of Google’s ethics. Sergey and Larry, we’re looking at you. Live up to your founding motto and Google’s mission. Walk away from this deal and save the Internet. Revealing that their budget was “tens of thousands” of dollars, PCCC would not reveal the money spent on Google ads vs. Facebook ads, saying only that there are probably more on Facebook and the ads are still going up currently.